Dr. Burcak Ebin is working on recycling of alkaline, NiMH and Li-ion battery waste by pyrometallurgical processes. In the case of the pyrometallurgical processes, there are two possibilities of treatment: processes of secondary metallurgy, which uses batteries as raw material, and processes created specifically for batteries. Our research focuses on developing revolutionary processes for recovery of materials for batteries. 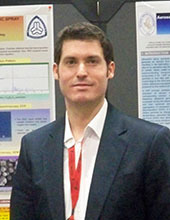 He is also an expert on nanoparticle production, spray pyrolysis process and Li-ion batteries. There might be more projects where Burcak Ebin participates, but you have to be logged in as a Chalmers employee to see them.